Mark Powell of Saluki Motorsport and Annie Seel teamed up again for the Emirates Desert Championship. A foggy morning delayed the start of the race but as the sun climbed the visibility cleared. The first lap had to be driven carefully. The course was very technical in small sharp dunes with drops and steps, and suited the smaller buggies perfectly. The big green beast of Saluki Motorsport had a new gearbox put in since last race in October where it ceased just before the finish line, and was only out for shake down. Overall winner was Khalid Al Jafla in a Can-Am turbo buggy. Mark and Annie took a first in class and sixth overall. This entry was posted in Dakar and tagged Annie Seel, buggy, championship, Desert, emirates, Mark Powell, motorsport, rally, saluki, womeninmotorsport. 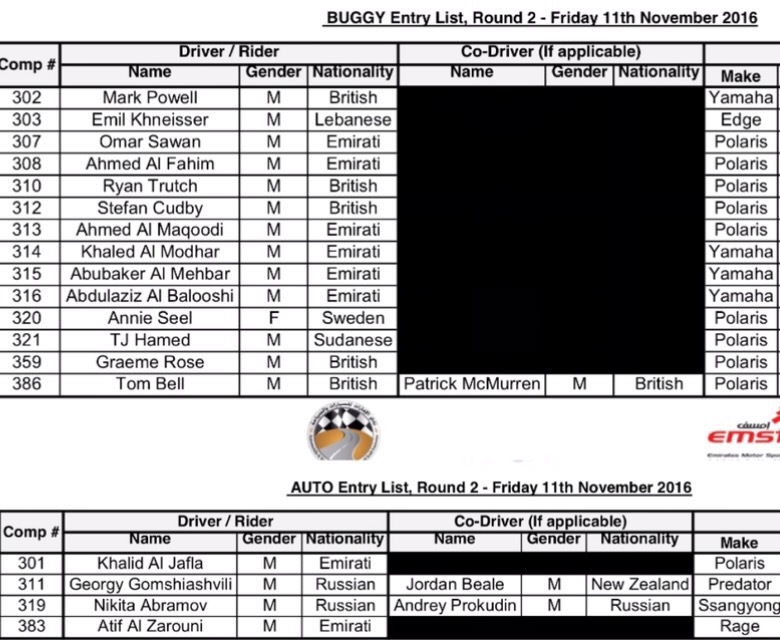 The entry list for the round 2 of EDC starting on Friday the 11 Nov.
14 buggies on the starting line, 4 in auto class, and 85 moto/quad. This entry was posted in Rally, Uncategorized and tagged Annie Seel, championship, Desert, dubai, emirates, polaris, rally, saluki motorsport. -It was a really tough stage in the desert today, I was longing to reach the end of the stage and pass the finishing line. Of course I feel good about increasing the gap between me and my competitors, but it only takes a small error to loose that advantage, thats the way the Dakar works, Annie Seel says. So far navigation has worked like a clock, and that is a benefit out in the desert. 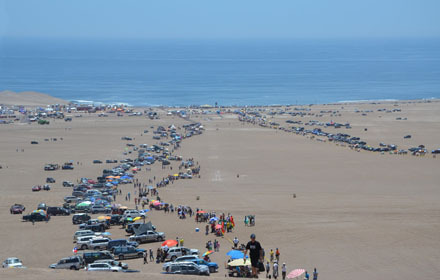 -I will enjoy myself tomorrow in Arica, and rest my hurting back. Then we start again on Sunday. I will ride safe and not take any chances, taking one day at a time. My goal was to defend my title, and thats what I intend to do. – Längtade till målgången, det var en riktigt hård dag i öknen. Känns såklart skönt att ha utökat minutrarna till Laia, men det krävs bara ett endaste litet misstag, en navigationsmiss eller ett problem med motorcykeln så har man tappat försprånget, så fungerar det i Dakar, säger Annie Seel. Hittills har jag träffat alla waypoints rätt, och navigationen har fungerat perfekt. – Ska bli jätte skönt, fick en rejäl sträckning i ryggen som störde, och nu får jag ta igen mig. Sen är det som vanligt, att ta en dag i taget säger Annie Seel. Och jag kommer inte ta några risker, som jag kanske har gjort tidigare år, nu är det säker körning som gäller för att säkra titeln ytterligare en gång. Video from the start in Buenos Aires, sent by a fan José Oviedo on Facebook. 6 seconds worth gold! 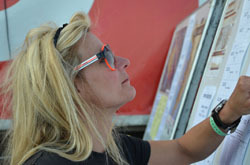 This entry was posted in 2011, Success, Tough challenge and tagged 2011, Annie, competition, Dakar, Desert, rally.